Brajesh's note on Pokhran II is hard to dispute. That's what irks the BJP. Every time Brajesh Mishra speaks, the BJP ties itself up in knots. It has become a regular political skit. Mishra pops up like a jack in the box and makes a statement; the BJP spokespersons, solemn-faced, say "he is not a member of our party". This happened again last week when days before the 10th anniversary of Pokhran II, Brajesh told Hindustan Times that the "weaponisation was ordered by Rajiv Gandhi". For those who follow issues of strategic defence, there was nothing extraordinary in the statement. Atal Behari Vajpayee was sworn in as PM on March 19, 1998, and the tests took place on May 11. Clearly, Indian scientists couldn't have put together a nuclear bomb in little over a month. Presumably, there was a weapons programme already in place. Now Vajpayee's former principal secretary was simply stating this. The problem with the statement was political. The BJP has always tried to create an impression that without Vajpayee at the helm, India would never have become a nuclear weapons state. The "we built the bomb" spiel fits in well with the idea of the strong Hindu nation propagated by the Sangh parivar. That is why the BJP was irked by Brajesh's interview although this time the party chose not to have a public spat with the man still considered very close to an ailing Vajpayee. Congress leaders were only too happy to use Brajesh's words to further embarrass the saffron party. Union minister of state for external affairs Anand Sharma told Outlook: "We've always maintained that it was the Congress—and not the BJP—that made India nuclear-capable. We had refused to sign the npt given the nuclear proliferation in the region and we had a nuclear programme in place." Spokesman Abhishek Singhvi used stronger language: "We should applaud Mishra for stating the truth. The credit for establishing India's nuclear programme must go to Indira Gandhi, the credit for the accelerated pace of weaponisation belongs to Rajiv Gandhi. Narasimha Rao was about to do Pokhran II when the NDA came to power. That's why Vajpayee could do it in a few days." For good measure, he added "the BJP should not act like the proverbial ostrich in the sand but should be happy that Mr Mishra is acknowledging reality. And because Mishra was the lynchpin in Vajpayee's administration, there is a greater ring of authenticity in what he says." That, indeed, is the heart of the problem. Why does Brajesh take apparent delight in embarrassing or contradicting the BJP? Many BJP leaders believe that the former principal secretary has nothing to lose and may even get a few laughs from putting them in a spot. Says a senior leader: "Today, Mishra holds no position in the BJP. But there is a long history of his animosity with L.K. Advani." The dislike has only sharpened after the recent release of Advani's autobiography. As a BJP leader says, "Mishra looks bad in the book and the entire Vajpayee set-up comes through poorly. They have been blamed for all the mistakes of the NDA era." 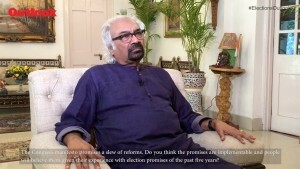 Ever since, Mishra has pointedly given interviews, following which the BJP has had to issue clarifications. A source close to Advani asks, sharply: "Who is Brajesh Mishra today?" Yet Brajesh is the keeper of the secrets of the Vajpayee era and he does have the potential to come out with 'revelations', giving an insider's account of a critical phase in contemporary history. He still makes a weekly visit to Vajpayee's home. Indeed, it is because Brajesh appears to have mastered the art of having his cake and eating it too that he remains a problem for the BJP. Consider his trajectory. A senior ifs officer and the son of legendary Congressman D.P. Mishra, Brajesh, post retirement, joined the BJP where he became convenor of the party's foreign affairs. 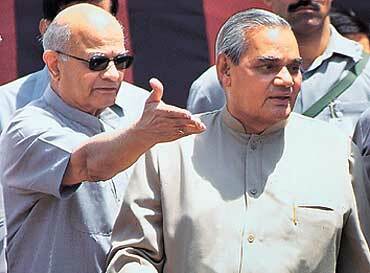 When the NDA came to power, he quit the party and became the all-powerful principal secretary and national security advisor in Vajpayee's pmo. Then the NDA lost in 2004, and he did not rejoin the BJP. But he didn't exactly become a private citizen either. He crafted out an extra-constitutional role for himself. He would be present at all meetings held at Vajpayee's residence to discuss foreign policy matters. In other words, he had power without being a BJP member. Lately, as Vajpayee's health problems magnified, Brajesh overstepped the line with his dramatic change of position on the Indo-US nuclear deal. Earlier, in July 2005, when the Manmohan Singh government first signed the agreement, Brajesh was one of the strongest opponents of the deal. The suspicion in the foreign policy circuit was that his opposition stemmed from pique. Says a BJP leader: "If the upa had flattered Brajesh and made him part of the consultation process, he would have persuaded Vajpayee to back the nuclear deal." Instead, Brajesh played a role in convincing the BJP to take an anti-deal position and then when Vajpayee became a waning force, changed his own stance late last year. Today he has become a strong votary of the nuclear deal, giving rise to suspicions that he is sending feelers to the Congress. But as a senior Congress leader puts it, "We think his real motive is to settle scores with Advani and to position himself as an influential voice on foreign policy. Besides, he is of greater use to us in the BJP." Union minister Kapil Sibal says quite bluntly: "Mishra may not be a political force anymore, but he realises that the nuclear deal is in India's best interests. He knows the deal is critical to India's position in the world. Sadly, the BJP has politicised India's national interest." Problem is that Brajesh himself was responsible for encouraging the BJP to take that position. In fact, over a year ago, when Advani tried to change the BJP line on the nuclear deal, Brajesh instigated the party to attack the leader of the opposition. Like his friend and mentor, he has tried to play both sides. But he is not Vajpayee. He's only Brajesh Mishra.